I picked up a bunch of more obscure (to me) New 52 titles at a book sale, and I figured I'd give them a shot. I did recognize the name "Deathstroke," for which I give myself a pat on the back. I don't remember where I heard it, mind, but it is familiar-ish to me. Aha, yes. Teen Titans. I never read any of the older TT comics, but I did watch the anime-style show that was on CN for a while. Now I know that those characters are very different from their comic book counterparts, but hey, it had a catchy theme song in Japanese and I thought Raven was pretty cool. After wading through Lemire's disappointing Teen Titans: Earth One last year, I fell down the Wikipedia rabbit hole reading about the team. They seriously need to stop trusting people, because it seems that everyone who joins the team ends up betraying them or turning evil. Deathstroke is one of the Titans' main enemies. So, he got his own comic! I think now that I know what to expect, I'd read more of these, but the first one was a little ... whoa. Deathstroke, who's a one-eyed metahuman (read: genetically enhanced and with more muscle mass than Jupiter), is an assassin for hire, pure and simple. 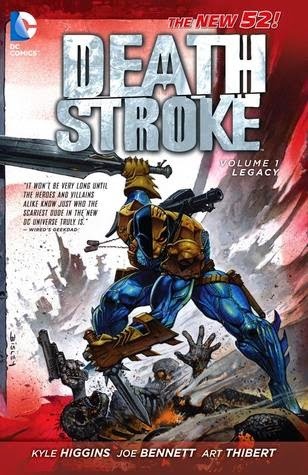 Some reviewers said strange things like, "I just couldn't feel for Deathstroke." Umm ... you're not supposed to. He's a bad guy. A thoroughly bad guy. Not a roguishly charming miscreant. This is a VERY BAD GUY who enjoys decapitating people. That's part of why I wasn't over the moon with this--it was so much blood and gore. I ended up skimming through a bunch of it. Plus, it was often done in these really big two page spreads that felt really busy, like my eye just didn't know where to go. And then there's the daddy issues. I get it. We have to insert some Deep Thoughts and Issues to mitigate the endless decapitations. You know how many superheroes have daddy/mommy issues? Yeah. This felt forced and silly. However, I did enjoy the fact that the comic made no apologies for Deathstroke and didn't try to turn him into a good guy. The villain with a heart of gold trope just would not work here, and thankfully the author avoided it. Obviously a lot of this relates to my personal preferences for what I read in comics, but it was also a good thing that I read it--I realized that I prefer my comics witty (Young Avengers) or weird (Chew) but just not out-and-out gory.